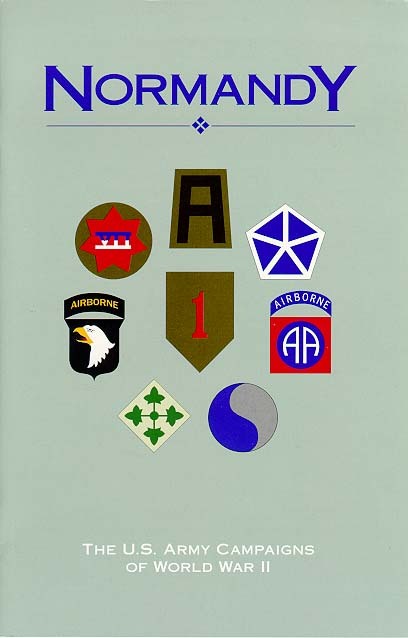 Cover: Shoulder sleeve insignia are of the American units, division and above, that were involved in the Normandy invasion on 6 June. This brochure was prepared in the U.S. Army Center of Military History by William M. Hammond. I hope this absorbing account of that period will enhance your appreciation of American achievements during World War II. A great invasion force stood off the Normandy coast of France as dawn broke on 6 June 1944: 9 battleships, 23 cruisers, 104 destroyers, and 71 large landing craft of various descriptions as well as troop transports, mine sweepers, and merchantmen-in all, nearly 5,000 ships of every type, the largest armada ever assembled. The naval bombardment that began at 0550 that morning detonated large minefields along the shoreline and destroyed a number of the enemy's defensive positions. To one correspondent, reporting from the deck of the cruiser HMS Hillary, it sounded like "the rhythmic beating of a gigantic drum" all along the coast. In the hours following the bombardment, more than 100,000 fighting men swept ashore to begin one of the epic assaults of history, a "mighty endeavor," as President Franklin D. Roosevelt described it to the American people, "to preserve . our civilization and to set free a suffering humanity." The British Chiefs of Staff charged Admiral Lord Louis Mountbatten and his Combined Operations Headquarters in September 1941 with investigating the feasibility of amphibious operations in the European theater of the war. Earlier, Admiral Sir Roger Keyes had undertaken some planning for commando raids, but Mountbatten was to do more. "You are to prepare for the invasion of Europe," British Prime Minister Winston S. Churchill told him. "You must devise and design the appliances, the landing craft, and the technique...The whole of the South Coast of England is a bastion of defense against the invasion of Hitler; you've got to turn it into the springboard for our attack." compliance with earlier, informal understandings, the two partners agreed to put first the defeat of Germany and its ally Italy if forced to wage a two-front war against both those nations and Japan. Shortly thereafter, British planners drafted a proposal, code-named ROUNDUP, for an attack across the English Channel into France. The assault would come only after a series of major campaigns on the periphery of Europe, in Scandinavia, the Mediterranean, the Balkans, and the Soviet Union, where the Germans would have difficulty massing their power. Once bombing, blockade, partisan uprisings, and the fighting on those other fronts had weakened the enemy sufficiently, ROUNDUP, or something like it, would begin. Despite talk that a Continental invasion might come as early as 1942, Allied leaders in the end decided tentatively to make the assault in 1943, either through Western Europe or the Balkans. Because British forces would bear the burden of operations in Europe until the United States could complete its buildup for war, the decisions that came out of the conference hewed closely to Britain's preference for attacks on Germany's periphery. Although the British later accepted an American proposal, code-named BOLERO, for the establishment in Britain of a million-man force trained and equipped for the 1943 invasion, the United States agreed that during 1942 Allied forces should concentrate on wearing down Germany's resistance through air attacks, operations along the North African coast, and assistance to the Soviet Union. To the Americans it seemed far better to seize the initiative from Germany with a bold assault than to allow the alliance's resources to dribble away in operations that would have little long-term effect on the enemy's will to resist. The British viewed the situation in Europe with an eye closely focused on their own circumstances and experience. 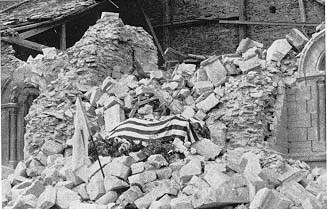 As conscious of their nation's lack of resources as the Americans were of the vast wealth available to the United States, they had already withstood a disaster at Dunkerque in 1940, when the Germans had driven a British army off the Continent in defeat, and at the French seacoast town of Dieppe in August 1942, when the Germans, at great cost to the Allies, had repelled a Canadian landing. Their experiences with amphibious warfare during World War I had been little better. Their forces had endured a bloodletting at Gallipoli in the Dardanelles, where landings championed by Churchill had failed. They had also lost an entire generation of young men to trench warfare on the stalemated Western Front in France. Britain's leaders thus had visions of catastrophe whenever the Americans raised the issue of a cross-Channel attack. If haste prevailed over reason, Churchill warned, the beaches of France might well be "choked with the bodies of the flower of American and British manhood." If the British had agreed in principle at the Arcadia Conference to an early attack across the Channel, by the end of 1942 they had nevertheless succeeded in shifting many of the resources marked for Bolero to TORCH, an Allied invasion of North Africa much more in accord with their own point of view. The American military had little choice but to go along. They not only lacked the landing craft, warplanes, and shipping necessary to carry out a cross-Channel attack, they also had to contend with their commander in chief, President Roosevelt, who had become convinced that some sort of immediate action against Germany was necessary to divert the attention of the American people from the Pacific to the Atlantic side of the war. The British point of view prevailed for much of the next year, causing Allied forces to fight on the fringes of the enemy's power in Sicily and southern Italy. By the middle of 1943, however, with victory in North Africa in hand, the fall of Italy near, and the first Russian victories in the east, the Americans renewed their call for a cross-Channel attack. A crash effort in the United States to construct shallow-draft landing vessels and long-range fighter aircraft had assured that at least minimum resources would be available to move a major force onto the beaches of France and to protect it from air attack. Meanwhile, the success of the anti-U-boat campaign in the Atlantic had guaranteed that the vast supplies of ammunition and provisions necessary for the invasion could move safely from the United States to staging areas in Great Britain. Although British leaders continued to advocate their peripheral strategy, the importance of American resources to the war effort had become so great that they had little choice but to go along with their ally. At the Casablanca Conference of January 1943 they thus agreed in principle to a 1944 invasion of the Continent. Shortly thereafter, the British General Staff appointed Lt. Gen. Frederick E. Morgan to be Chief of Staff (COS) to a still to be appointed Supreme Allied Commander (SAC) and gave him responsibility for planning the attack. By April 1943 Morgan had established an organization to carry out that task and had named it COSSAC after the initials in his new title. He warned his officers at that time to avoid thinking of themselves as planners and to see themselves instead as the embryo of a future supreme headquarters. "The term planning staff has come to have a most sinister meaning," he observed. "It implies the production of nothing but paper. What we must contrive to do somehow is to produce not only paper but action." Under Churchill's influence, the British for a time continued to argue in favor of possible operations in the Balkans. The Americans, however, suspected that their ally was more interested in securing a postwar empire than in defeating Germany as soon as possible. Refusing further delays, they won agreement for a 1 May 1944 attack during the May 1943 Trident Conference in Washington. One month later, the Quadrant Conference in Quebec reaffirmed the decision. any postponement of the invasion would constitute a breach of faith with the Russians. Wrangling continued over the Italian campaign and a possible invasion of southern France, code-named ANVIL, the flow of men and supplies to the Mediterranean theater slowed and the final buildup for the cross-Channel attack began in earnest. The selection of a commander for Allied forces required considerable thought. If the invasion had occurred early in the war, the British would have supplied the bulk of the resources and would have controlled the operation. Churchill had tentatively selected General Sir Alan Brooke for the task. But as the war lengthened and American resources became predominant, the selection of an American commander seemed appropriate. Roosevelt and Churchill first inclined toward the man who had played the principal role in coordinating the overall American military effort, U.S. Army Chief of Staff General George C. Marshall. When Roosevelt decided that Marshall's presence in Washington was indispensable, the Allies agreed on General Dwight D. Eisenhower, another well-experienced officer and the commander of Allied forces in North Africa and the Mediterranean. In the end, Eisenhower would serve as Supreme Allied Commander in Europe and as commanding general of all U.S. forces in the European Theater of Operations. Appointed as Supreme Commander of the Allied Expeditionary Force in December 1943, Eisenhower selected his former chief of staff in the Mediterranean, Lt. Gen. Walter Bedell Smith, to be his chief of staff in Europe. Smith transformed COSSAC into the supreme headquarters Morgan had envisioned and installed Morgan as his deputy. Aware of British sensitivities and attuned to the political difficulties that might develop if American generals came to dominate Allied councils, Eisenhower selected his principal commanders from among the British. Air Chief Marshal Sir Arthur Tedder became the Deputy Supreme Allied Commander and principal coordinator of the theater's air forces, and Admiral Sir Bertram Ramsay served as naval commander for the invasion. An American, Lt. Gen. Carl Spaatz, commanded U.S. Strategic Air Forces in Europe, while an Englishman, Air Chief Marshal Sir Arthur T. Harris, commanded the Royal Air Force's Bomber Command. Air Chief Marshal Sir Trafford Leigh-Mallory headed those portions of the Allied air forces concerned with tactical air support. base and air force. After considerable give and take, an arrangement suitable to all sides emerged. 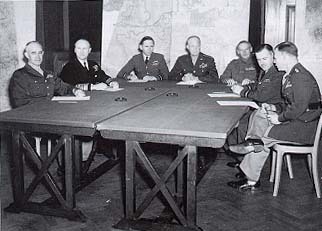 Subject to the oversight of the Combined Chiefs of Staff, a joint committee composed of the British Chiefs of Staff and their American counterparts, Eisenhower gained responsibility for the "direction" of strategic air forces. It was understood, however, that the cross-Channel attack, code-named Operation OVERLORD, would not absorb the entire bomber effort and that the air campaign against Germany would continue. French troops. The Third U.S. Army, commanded by Lt. Gen. George S. Patton, Jr., would enter the battle after the Allies had achieved a secure lodgment on the Continent. It would join the First U.S. Army, now commanded by Lt. Gen. Courtney Hodges, to form the 12th Army Group under Bradley. Lt. Gen. Henry D. G. Crerar's First Canadian Army would join Dempsey under Montgomery. During the summer of 1943, COSSAC had formulated a tentative plan of attack that involved a force of from three to five divisions. That assault would depend for supply upon the development of two prefabricated harbors, called MULBERRIES, that were to be positioned along with breakwaters composed of scuttled ships just off the invasion beaches. The MULBERRIES would give the Allies a measure of flexibility by allowing them to provision the force moving inland without having to rely upon the immediate capture of an established port. As COSSAC developed that plan, the question of where to land posed problems. The site would have to be within the range of fighter aircraft based in Great Britain but also on ground flat enough to construct the airfields that would become necessary once the invading force moved off the beaches and out of the range of its initial fighter support. The landing zones themselves would have to be sheltered from prevailing winds to facilitate around-the-clock resupply operations and would have to possess enough exits to allow the invading force to proceed inland with as little difficulty as possible. Similarly, the area behind the beaches would have to include a road network adequate to the needs of a force that intended to move rapidly. Since the region would ultimately form a base for the drive across France toward Germany, a series of large ports would also have to be close enough to facilitate the unloading of the massive quantities of supplies and ammunition that would be necessary to sustain the attack. Offering, as well, a satisfactory opening into the French interior, it became the site of the invasion. 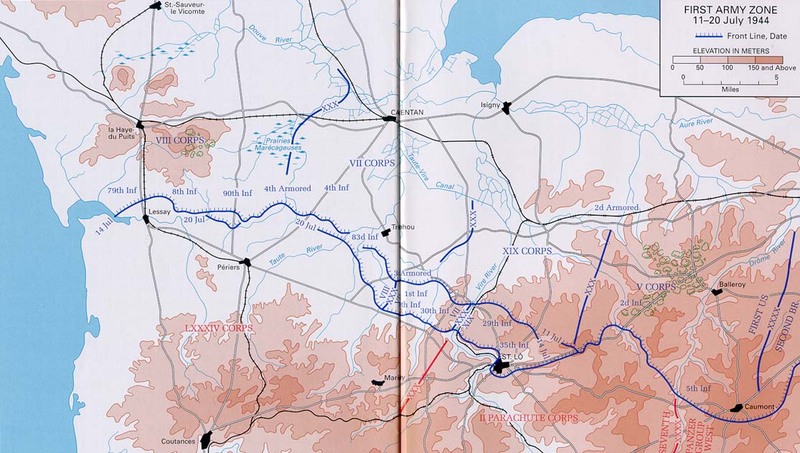 As planning continued, both Eisenhower and Montgomery recognized that the three- to five-division assault COSSAC had envisioned would have to be strengthened and spread over a larger area. 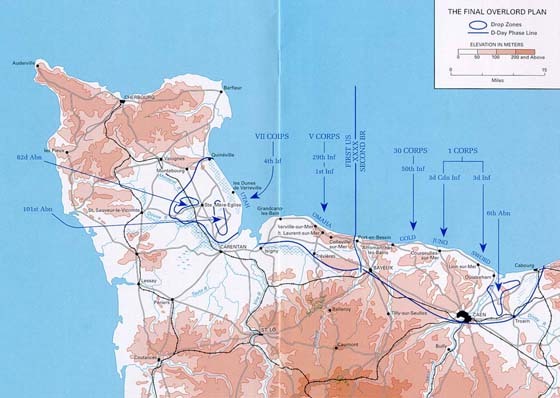 Looking toward the early capture of Cherbourg and the secure flow of supplies that port would ensure, Montgomery argued in favor of a broad attack somewhat west of Caen. Stretching from the area below that city into the region beyond the town of St. Martin-de-Varreville, the front he envisioned would have a breadth of some sixty miles. When Morgan's planners responded that a bridgehead of that size would require resources far in excess of those available, Montgomery asserted that nothing less would work and that the Allies would either have to find the means or another commander. Montgomery's insistence led to a sometimes acrimonious debate over the value of ANVIL, a plan to invade southern France that Eisenhower wanted to schedule simultaneously with OVERLORD. The invasion's planners considered the attack important and the conferees at Tehran had endorsed it, but the British-particularly Churchill- had never seen its merit. Hesitant at first to cancel the operation because it seemed a necessary diversion for the main effort in the Cotentin, Eisenhower in the end agreed to a postponement. Given the enlarged scope of OVERLORD, no other alternative seemed possible. There were too few landing craft to go around. Although the debate over ANVIL continued, by 23 January 1944 the Allies had settled on a basic plan of attack for Normandy. The Americans would take the western flank closest to Cherbourg while the British operated to the east, on the approaches to Caen. Logistics determined the arrangement. American forces had arrived in Britain via the country's western ports and had positioned depots in those areas. It made sense for them to operate near those bases. 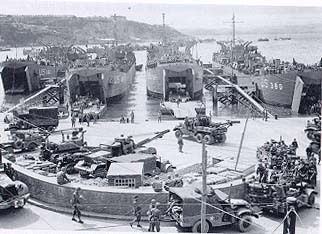 In addition, responding to the congestion in Britain's ports brought on by preparations for the invasion, American logisticians planned to load ships in the United States for direct discharge onto the beaches of France, without an intermediate unloading in Britain. The western flank was closer to that line of supply. On the night before the invasion, the U.S. 82d and 101st Airborne Divisions would land by parachute and glider near the town of Ste. Mere-Eglise, securing the roads that led from the shoreline and obstructing enemy efforts to reinforce beach defenses. The next morning Bradley's First Army would arrive. The VII Corps would put the U.S. 4th Division ashore on UTAH Beach near les Dunes de Varreville. To the east, the Second British Army would operate in the region between Bayeux and Caen, an area that possessed suitable sites for airfields and that offered a relatively unimpeded route to Paris. As in the American sector, an airborne division, the British 6th, would secure the northeastern flank of the operation, dropping during the hours before dawn near Caen and the mouth of the Orne River. At H-hour, the British 50th Division under the British 30 Corps would come ashore on GOLD Beach, near Bayeux and the American zone, while 1 Corps conducted a two-pronged attack farther to the east. There, the 3d Canadian Division would cross JUNO Beach near the town of Courseulles and the British 3d Division would come ashore at SWORD, near Lion-sur-Mer. "In the initial stages," Montgomery told his officers, "we should concentrate on gaining control quickly of the main centres of road communications. We should then push our armoured formations between and beyond these centres and deploy them on suitable ground. In this way it would be difficult for the enemy to bring up his reserves and get them past these armoured formations." Over all, Allied planners intended to gain a lodgment between the Seine and Loire Rivers. 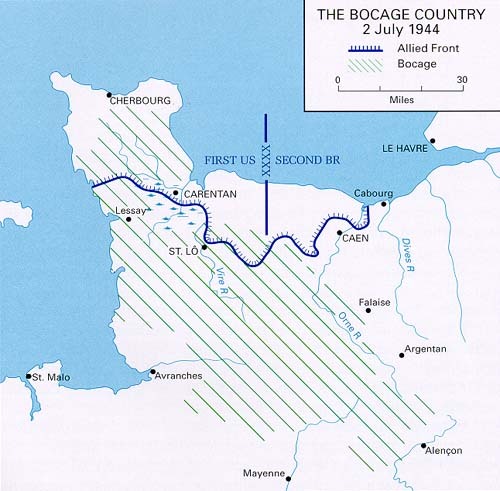 Assuming that the Germans, after initial resistance, would choose to withdraw their forces behind the natural barrier provided by the Seine, they estimated that the task would take about ninety days. After a pause to regroup and resupply, the Allies would then begin an advance into the regions beyond the Seine and toward Germany. first six months of 1944, rising from 774,000 at the beginning of the year to 1,537,000 in the week preceding the final assault. More than 16 million tons of supplies would be needed to feed and supply those men and their allies: six and one-quarter pounds of rations per day per man; 137,000 jeeps, trucks, and half-tracks; 4,217 tanks and fully tracked vehicles; 3,500 artillery pieces; 12,000 aircraft; and huge stores of sundries-everything from dental amalgam for fillings to chewing gum and candy bars. Quarters and depots to house the entire force mushroomed across the English countryside, many in just the seventeen weeks that preceded the invasion. The fields of Somerset and Cornwall became armories for the vast stores of bombs and artillery shells that the operation would require. The congestion extended to Britain's harbors, where ships laden with more supplies stood by. By the day of the attack, besides the immense force of fighting ships that would land the troops in Normandy and of cargo vessels that continued to ply Atlantic supply routes, more than 3 million deadweight tons of merchant shipping were in direct service to the invasion. The huge size of the buildup notwithstanding, landing craft were in such short supply that Eisenhower postponed the invasion for one month, from May to June. While logisticians laid the base for the invasion, the Allied air forces opened the way for the attack itself by waging massive bombing campaigns in Germany and France. In Germany, between January and June 1944, Allied fighters swept the skies clear of German warplanes and took a heavy toll in pilots. As a result, by June 1944 the enemy lacked both the aircraft and the airmen to mount more than a token resistance to Allied plans. Meanwhile, in France, as members of the French resistance cut railroad tracks, sabotaged locomotives, and targeted supply trains, Allied aircraft bombed roads, bridges, and rail junctions to prevent the Germans from moving reinforcements toward the invasion beaches. To deceive the enemy's intelligence agencies, the attacks occurred along the entire length of the Channel coast. By June, despite intelligence reports questioning the value of the attacks, all rail routes across the Seine River north of Paris were closed; the transportation system in France was at the point of collapse. planners then set construction crews to building dummy installations of plywood and canvas and dotted them with an array of inflatable tanks and vehicles. They also anchored a vast armada of rubber landing craft in the Thames River estuary, where German reconnaissance aircraft were certain to spot them. Eisenhower assigned Patton, the American general the Germans most respected, to command the phantom army and saw to it that known enemy agents received information on the status of Patton's force. Allied naval units conducted protracted maneuvers off the Channel coast near the location of the shadow army, and components of Patton's fictitious command indulged in extensive radio trafficking to signal to German intelligence analysts that a major military organization was functioning. A careful plan of aerial bombardment complemented the ploy. During the weeks preceding the invasion, Allied airmen dropped more bombs on the Pas de Calais than anywhere else in France. Although American commanders doubted that their ruses would have much effect, their schemes succeeded far beyond expectations. The Germans became so convinced that the Pas de Calais would be the Allied target that they held to the fiction until long after the actual attack had begun. As a result, nineteen powerful enemy divisions, to include important panzer reserves, stood idle on the day of the invasion, awaiting an assault that never came, when their presence in Normandy might have told heavily against the Allied attack. For their part, enemy forces labored against problems generated by a long war and an autocratic political system. In May 1942 the Germans had adopted a policy that gave the Russian Front first priority for troops and garrisoned the west with those who, because of wounds or other disabilities, were unable to endure the rigors imposed by that theater. Over the year that followed, twenty-two infantry and six armored divisions left France for the Eastern Front, along with the best equipment and men from the divisions that stayed behind. They were replaced by soldiers who were over-age or convalescing from wounds and by units composed of Russian, Italian, and Polish defectors. A few first-line units were present on the Western Front, but most of the rest had been shattered in the east and required replacements and refitting. The weapons they used were often leftovers. The artillery, for example, consisted of more than twenty types of guns, many of Czech or French rather than German manufacture. Training lagged because the men were frequently employed in crash efforts to build fortifications rather than in exercises to sharpen their combat skills. In theory, the German chain of command in the west was an example of good order. Adolf Hitler served as supreme commander of the Wehrmacht, the nation's armed forces. The High Command (OKW), led by Field Marshal Wilhelm Keitel, ran the war everywhere except in the Soviet Union. Navy Group West and the Third Air Fleet, in turn, managed Germany's naval and air forces in Western Europe while the ground force, some 58 divisions, came under the Oberbefehlshaber West (OB West), headed by Field Marshal Gerd von Rundstedt. OB West controlled two army groups, Army Group G. which had charge of the Mediterranean and Atlantic coasts of France, and Army Group B under Field Marshal Erwin Rommel, who had charge of anti-invasion forces along the Channel coast as far south as the Loire River. Rommel commanded two armies: the 15th, guarding the Pas de Calais and the Normandy coast to a line just south of the Seine River with 19 divisions (5 panzer), and the 7th, with 13 divisions (1 panzer), covering the coast from the boundary with the 15th Army to the Loire River. So logical on paper, those arrangements masked conditions in the field that were close to Byzantine. the operations staff of OKW as an intermediary, Hitler exercised direct control over Rundstedt's OR West. In theory a theater commander, Rundstedt had no authority over air force or naval units based within areas under his jurisdiction. The navy commanded most of the coastal artillery that would be called upon to repel an Allied attack, and the air force controlled the bulk of the antiaircraft and parachute units stationed in the region. Some armor units also came under the administrative supervision of the SS (Schutzstaffel), the elite political army that answered first to Hitler and Berlin rather than to its supposed commanders in the field. The manner in which Rommel exercised authority at Army Group B was symptomatic of the debilities afflicting the German staff. Subordinate in theory to Rundstedt, Rommel was his equal in rank. Much more forceful than Rundstedt in personality, he came to exercise far more influence than his position would normally have dictated. In addition, as a field marshal, he had the privilege of communicating directly with Hitler outside the chain of command. Thus he had the ability to undercut his superior whenever he wished. Rommel disagreed with Rundstedt over how best to repel an Allied invasion. Rundstedt placed great reliance on mechanized reserves that could respond quickly and flexibly to an enemy thrust. To that end, he stationed a newly created armored command, Panzer Group West, near Paris. From there, the force could move, as circumstances required, toward the site of an enemy assault in either the Pas de Calais or Normandy. Understanding the ability of the Allied air forces to isolate a battlefield and inhibit the movement of ground troops, Rommel believed Allied air superiority in France prevented the sort of mobile response Rundstedt envisioned. If Eisenhower's forces gained even the barest foothold on the Continent, he reasoned, they would win the war. To prevent that, German forces would have to repel the invasion at the water's edge through the use of well-dug-in and stationary troop formations on the shoreline. Directing his efforts to that end, Rommel built beach defenses, laid down minefields, and constructed obstacles to entangle Allied landing craft before they reached land. He also applied personally to Hitler, over Rundstedt's head, for control of the panzer divisions he believed he needed to reinforce his design. over four others that were to operate as a central reserve. Hitler's caution satisfied neither field marshal and deprived each of the decisive authority over armor that would become critical as the battle for France evolved. The malaise gripping the Wehrmacht might have made little difference if Hitler had been more forceful in preparing for the inevitable invasion. Although his generals, misled by the Allied deception plan, believed that the main Allied assault would come in the Pas de Calais, he thought that the attack would occur near Caen, and he said as much during March. Yet he failed to push the idea with any vigor, perhaps because he doubted his intuition in the face of his generals' certainty. Lacking any impetus from Hitler, his subordinates took no action on his insight. Based on Allied naval activities, Germany's naval commander in France likewise predicted the true site of the invasion but also neglected to take adequate precautions. He reasoned that the Allies had yet to concentrate the weight of their air power on targets in the region and so were obviously unprepared to carry out the attack. The ruse enacted by Patton's nonexistent 1st Army Group was not the only reason that German commanders failed to deduce the correct location of the Allied attack. By 1944 Britain's secret services had deprived Germany of its eyes by identifying and either turning or eliminating virtually every enemy agent assigned to their shores. Meanwhile, Allied warships had rendered German naval patrols in the English Channel ineffective, and Allied bombers had destroyed most of the German radar units that might have monitored air and naval traffic near the invasion beaches. A German spy working in the British embassy in Ankara had provided his mentors in Berlin with the code name for the invasion-OVERLORD but the revelation apparently carried little weight and led to no concrete action. German intelligence had also managed to learn that the British Broadcasting Corporation would transmit two lines of a poem by the nineteenth century author Paul Verlaine to warn the French Resistance that the attack was imminent. Even so, that finding was of little use without firm indications of where and when the invasion would occur. that, given their enemy's air superiority, would spell virtually certain death for most of those involved. Despite the impediments dogging German forces, Rommel and Rundstedt still possessed a number of tangible assets that would work to their advantage once the invasion began. The terrain in Normandy where the Allies would land consisted of small fields and pastures ringed by dense, tangled shrubbery, the so-called bocage. Each of them constituted a natural fortification and killing ground. In the same way, the overarching limbs of trees sheltered many rural lanes in the area. German commanders could use those byways as hidden corridors to move men and supplies. Even large, open areas were easily defended. Rommel peppered those that were suitable for the landing of gliders and paratroopers with mines, booby-trapped wooden stakes called Rommel's asparagus, and other obstructions. Since the regions near the mouths of Normandy's rivers and streams were often reclaimed marshlands, the field marshal had his engineers return them to their natural state by opening dikes and floodgates that held in check spring overflows. The deep inundations that followed would claim a number of the paratroopers who dropped into Normandy on the night of the invasion and would inhibit efforts to close the gap between the American forces fighting on OMAHA and UTAH Beaches. 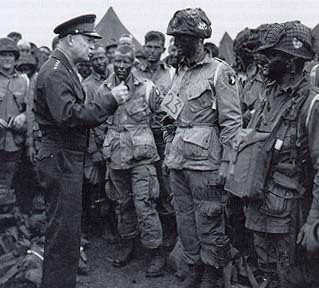 man who accompanied Eisenhower later told friends he had seen tears in the general's eyes. As planned, airborne units led the invasion. Shortly after midnight the British 6th Airborne Division dropped northeast of Caen, near the mouth of the Orne River, where it anchored the British eastern flank by securing bridges over the river and the Caen Canal. On the other side of the invasion area, the U.S. 101st and 82d Airborne Divisions dropped near Ste. Mere-Eglise and Carentan to secure road junctions and beach exits from which the VII Corps could push to capture Cherbourg. Some of the American airborne troops came to ground near their objectives, but most were scattered over a wide area. A number drowned in the flooded lowlands. Others landed in the midst of German positions, where they were killed or captured. In the hours that followed, nevertheless, paratroopers from the 101st succeeded in clearing much of the way for VII Corps' move inland. The 3d Battalion, 505th Infantry, of the 82d Airborne Division meanwhile captured Ste. Mere-Eglise and cut the main enemy communications cable to Cherbourg. Other units, entangled in the thickets and hedgerows of the region, failed to achieve their objectives, but by their very presence they sowed confusion in German ranks. Reports began to surface in enemy headquarters all along the line that paratroopers were landing, but little information was available to commanders on the size and meaning of the attack. Was it a probe to test Germany's defenses, a diversion for a larger assault in the Pas de Calais, or the long-awaited invasion itself? The Allies added to the confusion by parachuting dummies wired with firecrackers far to the rear of German positions. The trick drew major enemy units away from the landing zone, where their presence might have done considerable damage to the attackers. As dawn neared, bombers began to strike up and down the coast, flying the first of what would become, by the end of the day, more than 11,000 sorties against enemy batteries, headquarters, railroad junctions, and troop concentrations. The gliders Eisenhower had watched depart also arrived. Those of the British landed on target as did most of those from the U.S. 101st Airborne Division. Fewer than half of the gliders assigned to the U.S. 82d Airborne reached their assigned landing zones. The rest lodged in hedgerows, struck German obstructions, or floundered in the swollen marshes. By midmorning, 4,000 men of the 82d were still unaccounted for, along with 60 percent of the equipment they had carried. attack. The units, however, were in OKW reserve. Informed of the order, Rundstedt's superiors at OKW placed it on hold until Hitler himself could concur. Since he was asleep and disliked being awakened, approval took many hours to come and stalled what might have been a powerful German response. The few officers of Rommel's staff present in the area were more energetic. When they learned during the early morning hours that an enormous Allied fleet was approaching the coast, they ordered the 21st Panzer Division to Caen. By first light at 0530, the entire horizon off Normandy between Caen and Vierville-sur-Mer had filled with the invasion armada. "They came, rank after relentless rank, ten lanes wide, twenty miles across, five thousand ships of every description," wrote one reporter that morning: "Coast Guard cutters, buoy-layers and motor launches," and "a formidable array of 702 warships." The naval bombardment began at 0550, detonating large German minefields and destroying many blockhouses and artillery positions. Emerging from behind a screen of smoke, three German torpedo boats attempted briefly to contest the attack, but only one inflicted any damage, sinking the Norwegian destroyer Svenner. It was the sole contribution of the German Navy to the fight that day. The Luftwaffe was equally absent, leading one young soldier to comment later, "We were all more or less expecting...dive bombers...continually backed by high level bombing. But no, nothing like that...The Luftwaffe is obviously smashed." The forces that arrived on UTAH also performed ably. Elements of the 4th and 24th Cavalry Squadrons (132 men) of the 4th Cavalry Group landed on the St. Marcouf Islands flanking the beach at 0430, two hours in advance of the main attack. Directed to clear enemy minefields, control points, and observation posts, they found the islands heavily mined but otherwise unoccupied. During the main attack, German artillery managed to sink the U.S. destroyer Corry; swift currents carried the landing craft of the 4th Division well to the south of their target onto a portion of the beach that was only lightly defended; and thirty-two amphibious tanks assigned to land in the first wave of the attack were delayed by the loss of a control vessel that struck a mine. Those setbacks notwithstanding, the assaulting troops quickly took the upper hand. Within three hours the enemy force defending the beach had surrendered and Allied troops and supplies were moving inland. In all, some 23,000 men came ashore at UTAH, at a cost for the day of 197 casualties among the ground forces. Theodore Roosevelt, Jr. Going ashore with the first wave, Roosevelt contributed materially to the success of his forces by personally reconnoitering the area inland from the beach. He then returned to the beachhead time and again, without concern for his own life, to lead groups of his men over a seawall through enemy fire to safety. He earned a Medal of Honor for his gallantry. If the attack went well on UTAH, the situation was quite different on OMAHA. Maj. Gen. Leonard T. Gerow's V Corps came up against the worst conditions encountered that day. High seas swamped many landing craft during the ten-mile run from mother ships to shore. Survivors reached land seasick and wobbling. Well over half (fifty-seven of ninety-six) of the dual-drive amphibious tanks assigned to the landing also went down, victims of heavy seas they had not been designed to withstand. Strong winds and adverse currents likewise pushed a significant number of landing craft away from their designated targets, into areas where commanding officers' maps were useless and supporting fires from friendly ships totally lacking. Bombing attacks by Allied aircraft and assaults by naval gunfire designed to soften enemy positions did little to improve the situation. Blinded by heavy clouds and concerned lest poorly aimed bombs strike the landing force on the beach, bomber pilots overshot their targets and dropped their loads up to three miles inland. Naval gunners had difficulty zeroing in on their targets. Most of the radios required by artillery spotters ashore had gone down with landing craft that never reached the beach. OMAHA itself was a tangle of obstructions: concrete cones, slanted poles, logs tilted seaward with mines lashed to their tips, and steel rails welded together at angles and so strongly set into the beach that their ends would stave in the bottoms of landing craft. The Germans had also made good use of a line of cliffs, four miles long and up to one hundred fifty feet in height, that paralleled the length of the landing zone. Dotting the ravines and draws that led through the bluffs with antitank and antipersonnel mines, they had scattered blockhouses, bunkers, and machine gun nests in strategic locations where they could dominate the shoreline below. Unknown to the Americans, the highly disciplined 352d Infantry Division manned many of those fortifications. Its presence in the area had been suspected by some intelligence analysts, but the evidence they presented had proved too uncertain to affect planning for the attack. of approach to the beach by blasting lanes through the obstructions. Despite a series of mishaps-of 16 bulldozers, for example, only 3 survived enemy fire and I was prevented from maneuvering freely by American riflemen who sought shelter from incoming rounds in its lee-they succeeded in opening six complete gaps. Even so, they could mark only one for use during high water because all the buoys and poles designated for that purpose had been destroyed by enemy artillery. Casualties for the engineering task force ran to 40 percent, most incurred in the first half-hour of the attack. As the day lengthened, those conditions combined to produce a near-inferno on OMAHA. Enemy mortar and artillery batteries, unscathed by Allied fire, poured destruction upon the attackers while the invading force time and again appeared to fumble. Allied rocket ships responded, but from extreme range. When their missiles fell short, they hit the troops on the beach. Wreckage at the water's edge accumulated as timetables slipped and landing craft became hopelessly entangled in the barbed wire and projecting beams of uncleared beach obstructions. Even those craft that succeeded in ramming their way forward encountered difficulties. Riding a rising tide, most grounded on unforeseen sandbars located 50 to 100 yards from the surf's edge. There, enemy machine guns claimed a heavy toll of the debarking troops, who had to wade to shore with all their equipment through water that was often neck deep. In the end, perhaps a little more than one-third of the first wave of attackers reached dry land. 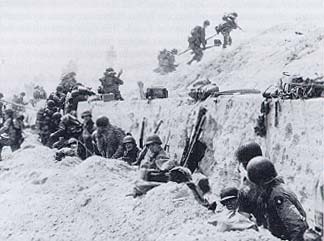 Lacking most of their heavy weapons, those survivors had little choice but to huddle behind sand dunes and in the lee of a small seawall that ran along the base of the beach. Many soldiers were killed outright, but some, wounded and unable to move, drowned as the tide moved in. There were heroes on OMAHA that morning. The medical corpsmen accompanying the operation saved many lives, working frantically under intense fire to rescue anyone they could reach. Five men of the 16th Infantry were later decorated for their heroism in struggling ashore with vital radios and wire. T5g. John J. Finder, Jr., received a posthumous Medal of Honor for his bravery in recovering two radios and other equipment despite severe wounds. He died when he entered the surf for a third time to recover yet another precious radio. The Germans were elated. Convinced that the attack was faltering, the commander of the 352d Division transferred some of his reserves to the east, where the British appeared a greater threat. General Bradley was distressed and for a time debated whether to cancel the assault and to move the remainder of his force to UTAH Beach. If chaos ruled at first, order asserted itself as the day lengthened. In some areas, heavy smoke from grass fires and exploding ammunition obscured landing zones and blinded enemy gunners, allowing the attackers to advance largely unopposed. Here and there, as well, tanks arrived, rolling off landing craft that had somehow plowed their way through the obstacles. Bringing their guns to bear, they began to provide the fire support the men on the beach required. The remnants of three companies of Rangers who had come ashore with the first units also did good work. Assigned to destroy a battery of six partially casemated 155-mm. guns thought to be positioned atop a promontory named the Pointe du Hoe, those highly disciplined infantrymen scaled the nearly l00-foot height and cleared it of its German defenders. Although the guns had been moved a few hundred yards inland the Rangers still managed to spike them. They then held their position for two days against waves of counterattacking Germans, incurring losses that would reduce their combat effectives to about ninety men before reinforcements finally arrived. Unit cohesion had disintegrated among the troops on the beach, especially within the inexperienced 29th Division, but leaders of all ranks asserted themselves and saved the day. "Two kinds of people are staying on this beach," the commander of the 1st Division's 16th Infantry Regiment, Col. George A. Taylor, exclaimed to his men, "the dead and those who are going to die. Now let's get the hell out of here." The sergeants were especially abrupt. Resorting to curses they had hoarded for years, they exhorted their men to get off the beach. The 29th Division's assistant commander, Brig. Gen. Norman D. Cota, was particularly effective. Ignoring enemy fire, he moved up and down the shoreline among his troops, cajoling, rallying, urging them forward through the bluffs. batteries, they raked the cliffs with their guns. More and more landing craft also pushed their way to the beach, bringing new troops, heavy weapons, radios, and ammunition. absence of much room to maneuver, their attack had been unoriginal, a straightforward frontal assault, but the weight of their numbers and the enormous volume of supplies and equipment they began to bring to bear made the difference. 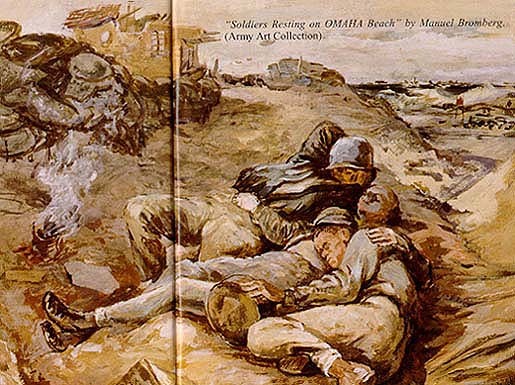 By nightfall, 34,000 men were ashore on OMAHA. The beach itself was a shambles of burning and disabled vehicles, but almost all of the coastal villages located inland were in Allied hands. The Germans, for their part, were in far worse condition than they seemed. Rommel's Seventh Army, commanded by Generaloberst Friedrich Dollmann, had succeeded in holding its own, but it had employed all of its resources in doing so and lacked the means to mount the sort of counterattack that might have driven the Allies back. Meanwhile, Hitler and Rundstedt remained reluctant to commit the reserves they held in the Pas de Calais because of the threat Patton's phantom army posed. Even if they had acted, Allied bombers might have decimated the force as it moved along the roads of France into Normandy. In the same way, the enemy retained sizable forces in Brittany, but German commanders refused to use them because a second landing from that direction seemed a clear possibility. Allied losses had been high: 2,500 men at OMAHA alone, another 2,500 among the American airborne divisions, almost 1,100 for the Canadians, and some 3,000 for the British-more than 9,000 men in all, one-third of whom were killed in action. Even so, the number was less than Allied planners had expected. Concerned that Hitler would respond to the invasion with extreme violence and might even resort to poison gas, Eisenhower's chief surgeon, Maj. Gen. Albert W. Kenner, and the Chief Surgeon of the U.S. Army's European Theater of Operations, Maj. Gen. Paul R. Hawley, had prepared their staffs to process at least 12,000 killed and wounded in the First U.S. Army alone. 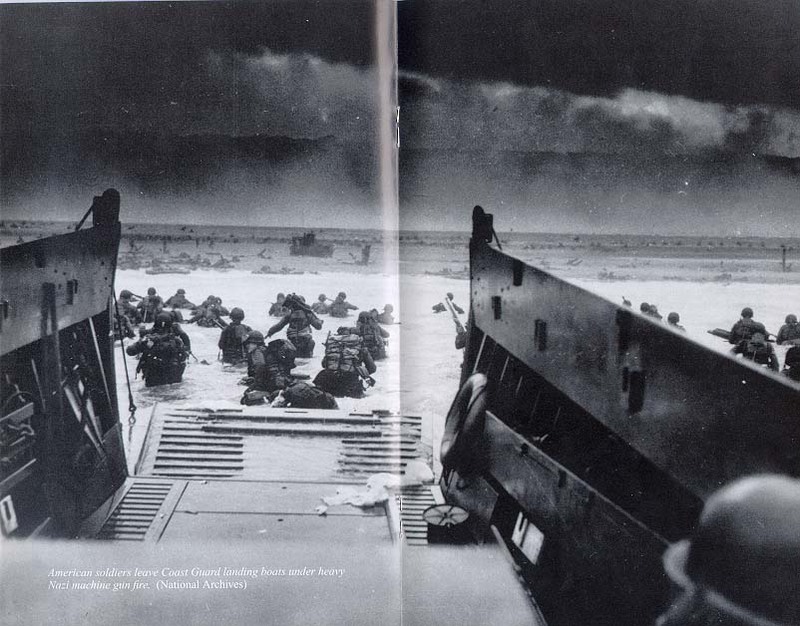 By the evening of 6 June 1944, Allied power had prevailed all across the Normandy beachhead. The British had failed to seize Caen. The Americans had yet to secure a lodgment far enough inland to keep enemy artillery from hitting supply dumps and unloading points they were building along the invasion beaches. Yet more than 100,000 men had come ashore, the first of millions who would follow. ioned. The problem would recur time and again in the days that followed. Allied air interdiction efforts were so effective and enemy forces so hard pressed that German commanders were rarely able to mass enough strength in a single place to make a sustained advance. Over time, Hitler's inflexibility compounded the problem. On 17 June Rundstedt and Rommel requested their leader's permission to withdraw their forces out of the range of naval gunfire before launching an armored attack on the flank of Montgomery's Second Army. Hitler refused. Convinced that the dogged efforts of soldiers who had stood and fought even when surrounded during the Battle of Moscow in 1941 had averted a German collapse, he believed the same would hold true in Normandy. He forbade his commanders to abandon any position voluntarily and ordered them to hold their ground at all costs. into trenches and fortifications. The hedgerows-some more than five feet in height and several feet thick-became traps concealing riflemen, machine guns, and infantrymen armed with antitank weapons. Because they assumed that the Germans would withdraw toward the Seine and fight a delay along the river's lines, the invasion's planners had concentrated on the challenge of getting ashore and had paid scant attention to the impediments posed by the bocage. As a result, Bradley's First Army was unprepared for the difficulties it faced and paid a steep price for each foot of its advance into the region. The experience of the U.S. 90th Division was a case in point. Faced with hostile fire from an invisible enemy, the unit's commanders found the principles of fire and maneuver nearly impossible to apply in the hedgerows, especially the precept that an attacking force should move just behind its artillery in order to confront the enemy while he is still off balance. The division suffered heavy casualties as a result-150 officers and 2,315 enlisted men during June and 310 officers and 5,188 enlisted men during July. More experienced units also suffered terribly in the bocage. A U.S. Army survey of casualties in portions of the 1st, 4th, 9th, and 25th Infantry Divisions between 6 June and 31 July 1944 found that rifle companies lost nearly 60 percent of their enlisted men and over 68 percent of their officers. The countryside in the British and Canadian sectors-a relatively open, flat, dry expanse stretching from Caen to Paris-was more favorable for offensive warfare. Paradoxically, those conditions made fighting there perhaps more difficult than in the American sector. The nature of the ground and the strategic importance of the area compelled the Germans to mass the bulk of their panzer units and their best troops in the path of Montgomery's forces. They turned the checkerboard of villages that dotted the region into an interlocking, mortar-and-concrete version of the bocage. Montgomery's commanders appear to have been little more prepared than the Americans for the sort of resistance the Germans mounted. Poorly versed in combined arms tactics, they allowed their tanks to advance without the protection of accompanying infantry units. That approach gave German soldiers wielding highly effective Panzerfausts (the enemy version of the American bazooka) and teams firing formidable, high-velocity antitank cannons a relatively free hand in dealing with the advancing forces. offensive to develop in the direction that time and circumstance dictated, whether in the American sector or his own. In that sense, it is possible that he decided Bradley's front offered the most opportunities and that his own army should concentrate on holding the enemy in place to allow his ally the fullest latitude. Or he may have thought that Allied advances elsewhere would allow him to achieve his objectives without incurring the level of casualties that had consumed an entire generation of his countrymen during World War I. He had been warned of a shortage of infantry replacements well before D-Day. 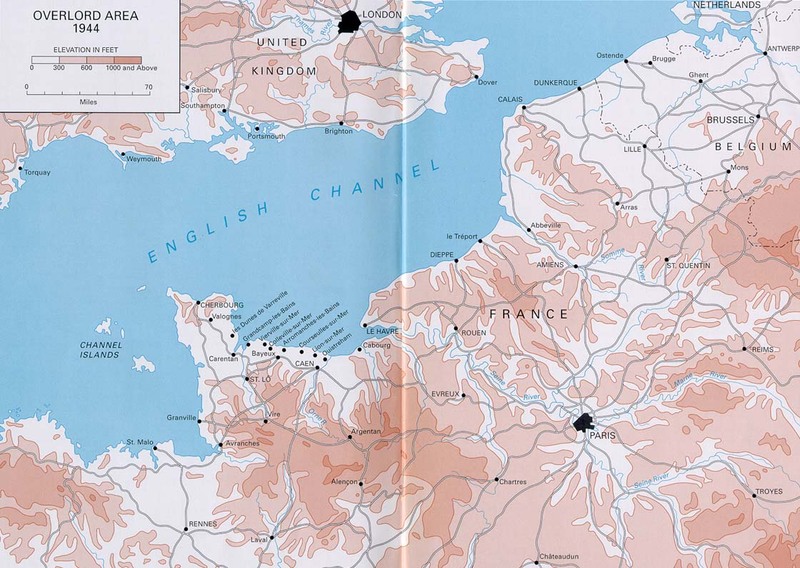 During July the British Adjutant General had underscored the point by personally traveling to Normandy to notify him that some British battalions had already been divided to fill gaps in the line and that divisions might be next. Whatever the reason, Montgomery's forces, commanded by Lt. Gen. Sir Miles Dempsey, took the town of Bayeux and moved several miles inland but-despite three full-scale attempts between 6 June and I July-failed to take Caen. Montgomery's intentions notwithstanding, British efforts were hardly without effect. The attacks his forces launched bled the Germans of strength they could ill afford to lose and kept the enemy's best units concentrated around Caen. That relieved some of the pressure on Bradley to the west, buying time and room for him to consolidate his beachhead on OMAHA and to turn his attention toward the capture of Cherbourg. In fact, Bradley needed all the help he could get. With the enemy well concealed in the hedgerows, it took an average of five Americans to displace one German defender. Under normal circumstances, a ratio of three to one would have sufficed. "Prior to invasion33' he later wrote, "we had estimated that the infantry would incur 70 percent of the losses of combat forces. By August we had boosted that figure to 83 percent on the basis of our experience in the Normandy hedgerows." Bradley illustrated his point by noting that, in fifteen days of fighting around St. Lo, the 30th Division sustained 3,934 battle casualties, a loss rate of 25 percent for the unit as a whole but of 90 percent in its rifle platoons, where three out of every four casualties occurred. 72.8 percent of their targeted level of supplies to that date. By 22 June, as a result of the storm, that figure had fallen to 57.4 percent. The buildup in vehicle strength fell over the same period from 66 to 57 percent and in personnel from 88 to 77.7 percent. Nevertheless, those impediments proved only temporary. Bradley's logisticians quickly learned to bring what they needed directly across the beach. By the last week in June, OMAHA was averaging 13,500 tons of supplies per day, 115 percent of planned capacity. UTAH, meanwhile, had achieved 7,000 tons per day, 125 percent of its target. By 18 June Maj. Gen. J. Lawton Collins' VII Corps had cut its way across the Cotentin Peninsula and had severed all roads leading into Cherbourg. Under orders from Hitler "to defend the last bunker and leave to the enemy not a harbor but a field of ruins," the remnants of five German divisions fought back stubbornly. The fighting around the city's main fortification, the Fort du Roule, embedded in a cliff overlooking the harbor, was particularly intense. 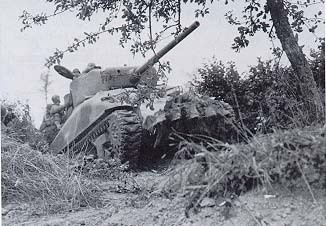 Coming under attack on 25 June, the stronghold's defenders leveled heavy fire at the attackers from a number of pillboxes and artillery positions. Several Americans distinguished themselves in the fighting. Cpl. John D. Kelly of Company E, 2d Battalion, 314th Infantry Regiment, won the Medal of Honor by single-handedly attacking a German pillbox three different times before succeeding in destroying it. Lt. Carlos C. Ogden, commanding Company K of the unit's 3d Battalion, won the same award in a similar action. Advancing alone with a rifle and grenades, he destroyed both an enemy 88-mm. gun and the machine gun positions guarding it. Both soldiers survived their encounters, but Kelly died in a subsequent action. The fort held out until the men of the 314th, after capturing the upper battlements, crushed diehard resisters by dropping demolitions into the bastion's lower reaches. Shortly thereafter, the city's commander surrendered but, on orders from Hitler relayed by Rommel, refused to instruct his troops to do the same. American psychological warfare officers turned the trick. Dropping surrender leaflets that emphasized dwindling food supplies within the city, they announced that all who came across should bring their mess kits. That evening, twenty days after the offensive had begun, Cherbourg was in friendly hands. bog down into the sort of crippling stalemate that had prevailed on the Western Front during World War I. As Allied morale rose, that of the Germans fell lower than ever. Hitler himself was unhappy. Exasperated with Rundstedt's continuing doubts and his desire to pull back to more defensible positions, he replaced the field marshal as Commander in Chief West on 2 July with Field Marshal Guenther von Kluge. Although at first optimistic, Kluge rapidly came to sympathize with Rundstedt's point of view. The fall of Cherbourg offered only temporary consolation to the Allies. 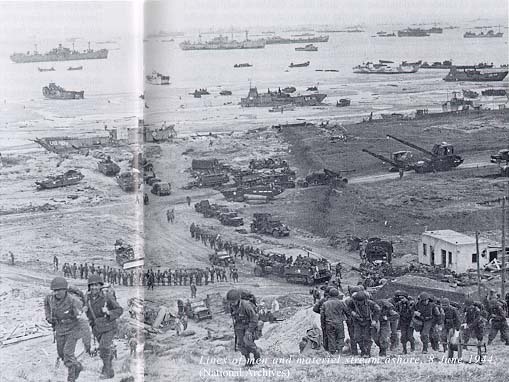 By I July they had established a beachhead 70 miles wide and had brought about a million men and 177,000 vehicles ashore. Yet, except around Cherbourg, their lodgment was in no place more than 25 miles deep, and in most areas it extended little more than 5 miles inland. On 9 July Montgomery launched a massive air assault against Caen in hopes of clearing the way for an attack the following morning. Four hundred fifty heavy aircraft participated, dropping 2,500 tons of bombs, but the airmen negated most of the effect by releasing their loads well back from the forward line to avoid hitting their own troops. As a result, the city incurred heavy damage but German defenses went largely unscathed. In the two days of desperate fighting that followed, the Germans fought back viciously. Montgomery's forces entered Caen and took half the city but moved no farther. Casualty rates during the battle were appalling. Most infantry battalions sustained losses of 25 percent. Bradley's advance on St. Lo was also an agony. Daily rains reduced visibility and negated much of the value of Allied air support. As with the British at Caen, the casualty rate was alarming. The 30th Division sustained some 3,000 killed and wounded between 7 and 20 July; the 9th suffered 2,500 between the 10th and the 20th. Bradley's forces were nonetheless gradually learning how to fight in the bocage. Tank and infantry units began to support each other. The tanks supplied the heavy firepower needed to eliminate the enemy's well-sited firing positions while the infantry kept enemy soldiers with antitank weapons at bay. The tankers also found a way to cross the hedgerows without exposing their vehicles' vulnerable undersides to enemy fire. With huge iron teeth salvaged from German beach obstacles welded to the fronts of hundreds of tanks, they began to bull their way through the hedgerows, taking hours to advance through obstacles that would earlier have required days of fighting to overcome. From then on, the Rhinos, as the men named them, became an invaluable asset to Bradley. They allowed American armor to move across country at will while German tanks had to continue to make do with the roads. By 15 July American forces had reached the outskirts of St. Lo, but the garrison holding the town refused yield. In a battle that inflicted carnage reminiscent of World War I, the Germans gave ground only gradually, house by house. On one occasion, as a result, American riflemen used a bulldozer to bury three German soldiers who refused to surrender their position. By 18 July the attackers had succeeded. A task force from the 29th Division under General Cota entered the town. Charles H. Gerhardt, considered Howie's response an example of the patriotic self-sacrifice that had carried the Army through to that point. By honoring Howie he could remind his men of the perseverance and courage of all those who had given their lives at St. Lo. On the same day, the British launched a major attack beyond Caen but again allowed their tanks to advance without supporting infantry and failed to inflict a decisive blow. In response Kluge increased the concentration of German troops around the city, adding two armored divisions that might have done invaluable work against Bradley in the bocage. As a result, 7 panzer divisions and 4 heavy tank battalions guarded Caen while only 2 panzer divisions confronted the Americans. Even those forces were sorely depleted. By the last week in July, according to ULTRA intercepts of coded German radio communications, the enemy in Normandy had sustained casualties of more than 100,000 enlisted men and 2,360 officers killed and wounded. On 17 July misfortune touched Rommel himself. Two British Spitfire fighters attacked his open car-ironically, near a village named Ste. Foy de Montgommery-and drove it into a ditch. Thrown from the vehicle, Rommel suffered head injuries so grievous that he had to return to Germany for treatment. Kluge succeeded him, assuming command of Army Group B while retaining his position as Commander in Chief West. It had been a grim fight. Six weeks of battle had left the Germans disheartened and susceptible to any farther blow the Allies might deliver. "It was casualty reports, casualty reports, casualty reports wherever you went," Rommel told his son Manfred from his sickbed. "I have never fought with such losses...And the worst of it is that it was all without sense or purpose." Indeed, Rommel continued, on some days the equivalent of a regiment of his men had fallen in Normandy-more than in a whole summer of fighting in Africa during 1942. The days had been filled with mud, heartache, and pain for the Allies as well. From the very beginning, little had seemed to go right. The airborne assault on the night before the landing had sown  confusion among the enemy and had provided an important diversion, but too many of the men had landed too far from their targets. As a result, the effort had only a marginal effect on the developing battle. Over the days that followed, rather than withdrawing beyond the Seine as Allied planners had expected, the Germans had hung on tenaciously, taking brutal losses but inflicting them upon the Allies as well. Meanwhile, Montgomery's careful plan for the attack had begun to unravel on D-Day itself. His forces failed to take Caen, the key to further operations in the open country to the south. Attacking time and again as the campaign developed, they had nonetheless held the cream of the German force in place, absorbing pressure that would almost inevitably have fallen upon Bradley's forces in the bocage. As for the Americans, the landing on OMAHA Beach had been a near-disaster averted only by the courage of unsung sailors and soldiers. When air attacks and naval gunfire had failed to silence German guns and the momentum of the assault had begun to lag, those heroes had pushed their frail landing craft to shore despite the traps and obstacles blocking their way. Rallying to the directions of their commanders, they had then climbed the bluffs overlooking the beach and advanced inland, often at the cost of their own lives. 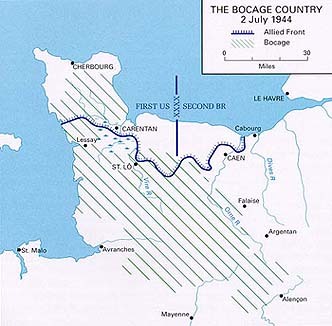 In the same way, although Maj. Gen. J. Lawton Collins' VII Corps captured the port of Cherbourg on 29 June, the American advance bogged down in the hedgerows. Bradley's First Army absorbed forty thousand casualties while slowly advancing twenty miles to St. Lo. ample means for Allied commanders to prevail. Cunning deceptions kept the Germans transfixed on the Pas de Calais until long after the real invasion had occurred; Allied airmen swept the skies clean of the enemy fighters and bombers that might have imposed a heavy toll upon the landing force; and the effort to build up the stocks of supplies and munitions necessary for an effective attack succeeded beyond the most optimistic expectation. In the end, notwithstanding, it was the heroism of infantrymen such as Major Howie, who rose day and night to the challenge despite almost overwhelming fear and fatigue, that afforded the critical margin for success. A barely failed assassination attempt upon Hitler's life, implicating Rommel himself, brought about a purge of officers in Germany that would, for a time, strengthen Hitler's control over his armed forces. Although the Germans would fight on with resilience and determination for another ten months, their line in France would soon break, Patton's army would swing clear, Paris would fall, and Allied forces would approach the Rhine. The loss of France would deprive Germany not only of a major source of Mod, raw resources, and labor but also of seaports that had long sheltered its U-boats and of radar sites that had afforded early warning of Allied bomber attacks. More important, it would provide the Allies with the secure base they needed to launch their final offensive against the German heartland. As Rommel told his son, the future was clear and inevitable. The end of Hitler's Reich was at hand: "There is no longer anything we can do." Those who wish to study the Normandy Campaign in more detail will find a number of volumes in the U.S. Army in World War II series, produced by the U.S. Army Center of Military History, particularly useful. Gordon A. Harrison, Cross-Channel-Attack (1951), remains a basic source, but a number of other studies bear heavily upon the operation. They include Robert W. Coakley and Richard M. Leighton, Global Logistics and Strategy (1968); Martin Blumenson, Breakout and Pursuit (1961); Forrest C. Pogue, The Supreme Command (1954); Roland G. Ruppenthal, Logistical Support of the Armies (1953); and Graham A. Cosmas and Albert E. Cowdrey, The Medical Department: Medical Service in the European Theater of Operations (1992). The Historical Division of the War Department produced three volumes on the event. All have been reprinted by the Center of Military History. Classified as the American Forces in Action series, they are OMAHA Beachhead (6 June-13 June 1944) (1989); UTAH Beach to Cherbourg (1990); and St. Lo (7 July-19 July 1944) (1984). A number of abbreviated summaries have been written. Among the most useful are Charles MacDonald, The Mighty Endeavor: American Armed Forces in the European Theater in World War II (1969); and Charles MacDonald and Martin Blumenson, "Recovery of France," in Vincent J. Esposito, ed., A Concise History of World War II (1965). Memoirs by Allied commanders contain considerable information. Among the best are Omar N. Bradley, A Soldier's Story (1951); Omar N. Bradley and Clay Blair, A General's Life (1983); Dwight D. Eisenhower, Crusade in Europe (1948); Sir Bernard Law Montgomery, Normandy to the Baltic (1948); and Sir Frederick Edgeworth Morgan, Overture to Overlord (1950). Almost as useful are biographies of leading commanders. Among the most prominent are Stephen E. Ambrose, The Supreme Commander: The War Years of General Dwight D. Eisenhower (1970), and Eisenhower, Soldier, General of the Army, President-Elect, 1890-1952 (1983); Nigel Hamilton, Master of the Battlefield: Monty's War Years, 1942-1944 (1983); and Richard Lamb, Montgomery in Europe, 1943-1945: Success or Failure (1984). A number of general histories also exist, many centering on the controversies that continue to surround the campaign and its commanders. See, in particular, John Colby, War From the Ground Up: The 90th Division in World War n (1989); Carlo D'Este, Decision in Normandy: The Unwritten Story of Montgomery and the Allied Campaign (1983); Max Hastings, Overlord, D-Day, June 6, 1944 (1984); John Keegan, Six Armies in Normandy: From D-Day to the Liberation of Paris (1982); Russell F. Weigley, Eisenhower's Lieutenants: The Campaign of France and Germany, 1944-45 (1981); and Stephen T. Powers, "Battle of Normandy: The Lingering Controversy," Journal of Military History 56 (1992):455-71.